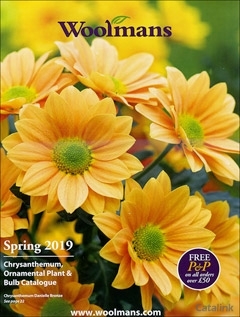 To order a printed copy of the Woolmans Plants catalogue, simply click the Request button below. The best selection of flowers around! Woolmans Plants are the Chrysanthemum specialists, supplier of top quality dahlias, carnations and bedding plants. Order a free copy of their catalogue today to explore all they have to offer! With over 150 varieties of chrysanthemum listed, plus a whole host of other decorative plants and flowers, Woolmans have everything you need to create a spectacular floral display at any time of the year. Explore their range of outdoor blooms, indoor flowering sprays, late indoor blooms and so much more today. Whether you're looking for Chrysanthemums, dahlias or other flower bulbs, you can find a great selection with them. Choose from decorative dahlias, perennial plants and basket plants to gladioli, lilies and so much more. Their selection of tools and equipment will help you craft the perfect environment, so you can rest assured that the perfect yield and conditions are never out of reach. Order your Woolmans catalogue now and take your first step towards a healthier garden and a happier you. Woolmans Plants Catalogue Vall C. said: Looks an excellent catalogue. Woolmans Plants Catalogue Alan R. said: I used Woolmans many years ago when i had my nursery . Always first class service and quality. Woolmans Plants Catalogue Mark W. said: very nice items in catalogue, but have not decided what to order as yet. Woolmans Plants Catalogue Trevor A. said: good and quite eye opening! TOOLSTOP offers professional tradespeople huge savings on quality hand and power tools.With vast stocks, volume discounts and next day delivery they can become your one stop shop for all your tool requirements. A comprehensive range of flower and vegetable seeds, young plants and bulbs. In fact everything that the keen gardener will need to create stunning displays. By pressing the Request Printed Catalogue button you give consent to Woolmans Plants (and their Data Processors for the specific purpose of delivering your literature) to send you their Catalogue.